The AEM Project — CascadiaNow! The AEM Project mission is to tell the whole and accurate story of the events leading up to the shoot-out at the Everett City Dock on November 5, 1916. What happened on that beautiful Sunday afternoon is moving, messy, and relevant than the story told in The Everett Massacre (I.W.W. Publishing Bureau, 1917). 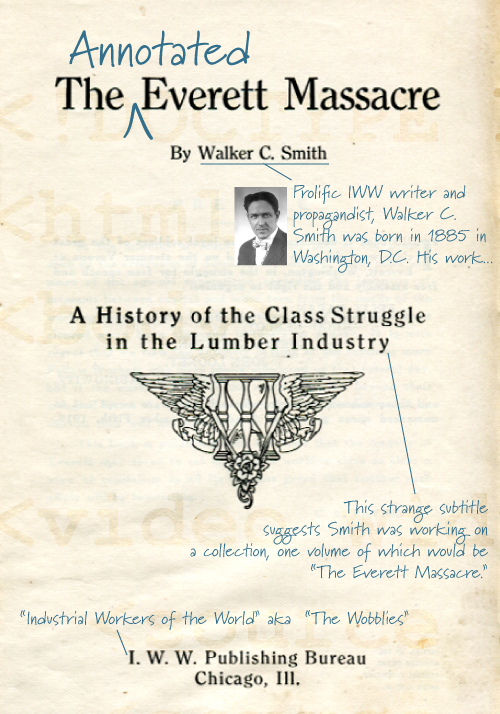 Author Walker C. Smith achieved his goal of spreading the message of the IWW. But propaganda and history are not synonymous, regardless of how attractive the propaganda is. What happened on that beautiful Sunday afternoon is more moving, more messy, and more relevant than what Smith gives us. The AEM project will launch the Annotated Everett Massacre (AEM) on everettmassacre.com by the end of 2018 to share what we've found about this deadly event that goes beyond the legend. In The Man Who Shot Liberty Valance, newspaper editor Maxwell Scott says, “This is the West, sir. When the legend becomes fact...print the legend.” It’s a great line delivered by a great actor, but we don’t live in the movies. When legend replaces fact, we all lose. We lose the truth about the lives of people who fought against income inequality, violence, and denial of their civil rights to build a more just society. We lose how hard and how dangerous it is to do the right thing because it is the right thing to do. This is true about what happened on that day in 1916. Vital information about the shoot-out is diffused, poorly integrated, and often difficult to find, interpret, and apply to life today. The AEM will give people access to archival materials and interpretation, offering context to the forces, personalities, and issues that resulted in killing, and show how this event was formative as a force of change for the working class. The public will rely on the AEM as a dependable source of Snohomish County history and make it the first stop when researching any aspect of the shoot-out at the Everett City Dock. The media will use the AEM to gain information about local history. Students, teachers, and scholars will use the AEM as a reliable source of information about this uniquely Cascadia story, including the participants, causes, and effects, and to challenge the propaganda surrounding this event. Denise Ohio’s third film, Verona: The Story of the Everett Massacre, was released in December 2017. In addition to being a filmmaker, Ohio has published four books and has experience as a web administrator, content creator, and user experience designer on a high-profile website. Catherine Minden has managed large website design projects and provided editorial and writing services for companies such as Microsoft and Amazon. With a background in academic publishing, she brings an emphasis on clarity and historical integrity.